Army and Marine Corps officials said Thursday that the branches are utilizing robotic systems in order to lighten the load of troops during combat, NextGov reports. Marine Corps Lt. Gen. Richard Mills told a House Armed Services subcommittee the Marines started using unmanned helicopters for Afghanistan efforts in December, according to the report. 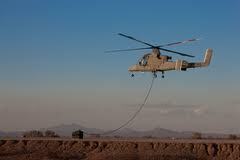 Lockheed Martin developed the K-Max helicopters for the Marines as part of a $45.8 million partnership with Kaman Aerospace. The helicopters can carry 6,000 pound-loads, according to NextGov. Mills told the subpanel the two unmanned, GPS-guided helicopters used for troops in Afghanistan proved themselves in both day and night operations and in bad weather, according to NextGov. Army Lt. Gen. William Phillips told the subpanel the Army is also benefiting from use of robots in combat, according to the report. Phillips said Army forces have used over 2,5000 iRobots-developed remote controlled robots armed with cameras and sensors to help ground troops detect crude bombs. Phillips said the Army is testing a Lockheed-built unmanned ground vehicle, called Squad Mission Support System, that is designed to carry up to half a ton of supplies. The vehicle will also have a GPS navigation system so it can be remotely controlled. According to NextGov, Army and Marines officials suggest use of unmanned aircraft and robotics systems should continue.